Maintenance Phase: Day 6 and beyond: Consume one (1) rounded teaspoon one (1) to two (2) times daily. Mix one (1) rounded teaspoon in eight (8) to ten (10) ounces of water or juice. Drink immediately. For best results, consume immediately after your workout. Loading Phase: Day 1 through 5: Consume one (1) rounded teaspoon four (4) times daily. Space servings evenly throughout the day. Not for use by individuals under the age of 18 years. Do not use if you are pregnant or nursing. Consult your physician prior to use if you are using any medications and/or have any medical conditions. Do not use if you have kidney disease. Discontinue use and call a physician or licensed qualified health care professional immediately if adverse reactions occur. Do not exceed recommended serving. Keep out of reach of children. The Purest, Safest, & Most Effective Creatine Available. Guaranteed. 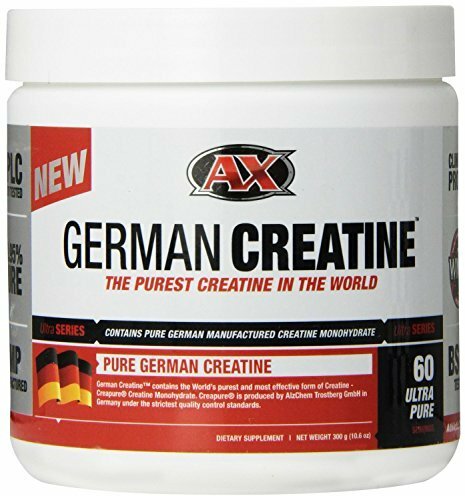 German Creatine contains Creapure Creatine Monohydrate. It is manufactured in Germany and is the purest, safest and most effective form of Creatine on the World market today. 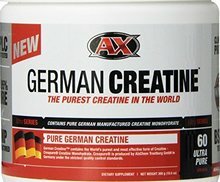 Why Use German Creatine Over Other Creatines? Why? Because lower quality Creatines contain higher levels of impurities. These impurities include Dicyandiamide (DCD), Dihydrotriazine (DHT), Creatinine, Thiourea, and Sodium. Unfortunately, the long term effects of these impurities remain unknown. And because Creatine is used in large amounts for extended periods of time, the quality of Creatine you consume is incredibly important. Our goal is to bring you the safest and most effective Creatine in the World. And that's why we've chosen to use pure German manufactured Creapure in German Creatine, which is guaranteed to contain the highest purity level ever - a minimum 99.95%. If you've used other Creatines in the past, no doubt you've experienced excessive water retention resulting in a soft, bloated look to your muscles. This may be due to inferior manufacturing processes that leave excess Sodium in the finished product. Creapure is manufactured in Germany using a patented manufacturing process that has produced the purest Creatine in the World. And unlike cheaper forms, you will not experience excessive water retention. The use of inferior raw materials and sub-optimal manufacturing processes can result in Creatine containing high levels of impurities. With German Creatine, this is not the case. The Creapure you'll be using in German Creatine is manufactured for your safety in Germany under strict GMP conditions and verified for purity using High Pressure Liquid Chromatography (HPLC). This guarantees that you're giving your body only the purest, safest, and highest quality Creatine available. Only Creapure has been investigated in more than 50 clinical trialssupporting its short term safety. And numerous clinical trials have supported Creapure's long term safety as well. In addition, no toxic effects have ever been determined from Creapure testing. The same cannot be said for other Creatines on the market that do not contain Creapure. Experience the German Creatine Difference. Week 4: It's been 4 weeks, and you no longer believe that "Creatine is Creatine." The quality and purity of Creapure has made a profound difference. For the past few weeks, you've been able to lift heavier weights for longer periods of time. As a result, your strength has dramatically increased. Looking at your body now compared to the "Before" photo you took on day 1, you see that your muscle mass has increased significantly thanks to the combination of German Creatine, stronger workouts and proper diet.